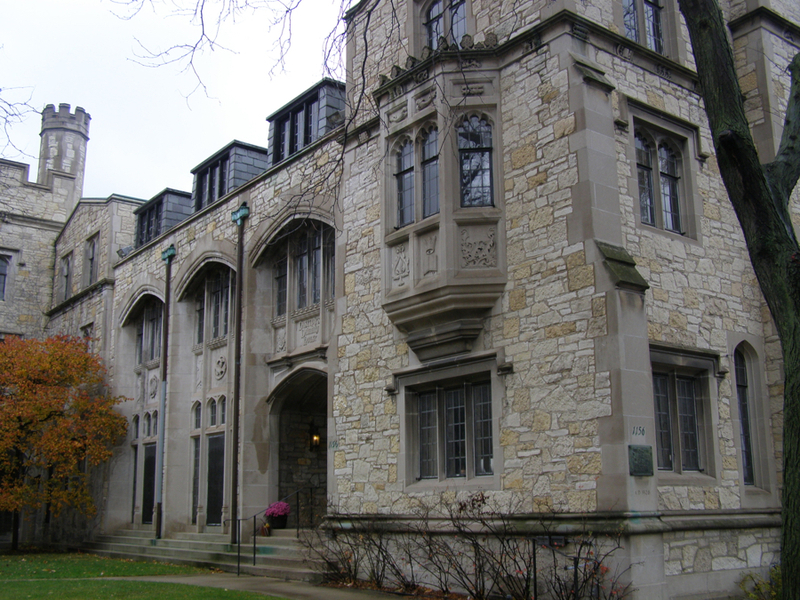 Disciples Divinity House originated through the effort of W.D. MacClintock, an English professor at the University of Chicago, and Herbert L. Willett. the school was chartered in 1894. By 1898 there were only 20 students, and now it is open for everyone, but cracking and dislodged Indiana limestone above the portico entry was hazardous to pedestrians. Marion Restoration Company had a chance to help Divinity House be less dangerous for its inhabitants. The stone lintels have been removed for restoration and reinstalled. The existing steel lintels have been cleaned and treated with a rust inhibitor. Before we started the process, we made a cleaning test which helped us ensure cleaning methods are appropriate for this kind of masonry building. We have also repointed 100% of snecked rubble cheek walls at third floor level adjacent to dormers using USHG lime-based mortar matching the historic mortar, resealed junction between cheek wall masonry and roof flashing and repaired the window mullion at the South end of the 3rd floor.